“Fauda,” with Hebrew and Arabic dialogue, will air as is, but as an “original Netflix series,” with a new Netflix-produced opening. In some countries, the show will have subtitles, while in others, such as in South America and Eastern Europe, it will be dubbed. The show was co-created by lead actor Lior Raz and writer Avi Isaacharoff. Mr. Issacharoff is an Israeli journalist known for his focus on Palestinian affairs. He is Middle East analyst for The Times of Israel and its sister news portal Walla! From 2005 until 2012, he was the Palestinian and Arab affairs correspondent for the Israeli newspaper Ha'aretz. The two filmmakers appeared at the Netflix premiere screening in Hollywood this Monday, but they were not available to tape an interview with JooTube. Lior Raz appeared at international film festival screenings in Europe last year where the show (first 2 episodes combined) met with wide acclaim among liberal judges in Israel-loathing / Palestinian-loving Europe. 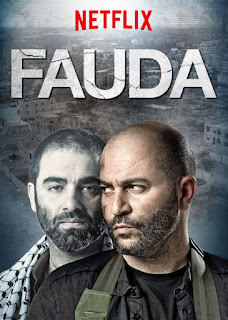 Text excerpts: "Netflix Buys Rights to Two New Israeli Shows"
'Fauda' will air as is, with Hebrew and Arabic dialogue, as an 'original Neflix series' with a new opening.